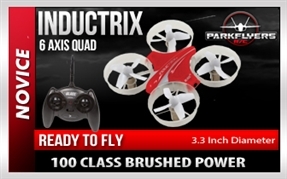 Parkflyers RC only sells the very best in Radio Control Quadcopters and RC Drones. All of our models are "READY TO FLY". and come with everything needed to fly in one box. Some of our Quadcopters and Drones have on board video cameras. 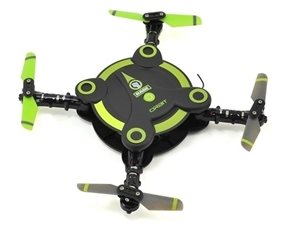 All feature 6 axis auto-leveling gyro technology for super stable flight even in high wind conditions. The JetMan Go Drone RTF is a unique, fun aircraft that is easy to fly, yet small enough to fly around the house. The built-in 6-axis gyro control system provides amazing stability, features like Auto Take-Off and Landing and Altitude Hold assist in learning to control the JetMan Go Drone RTF. The Dual Rate feature enables you to increase the speed and agility of the aircraft as your skills progress and you can even add 360o flips in any direction to your flying repertoire. For play value, the JetMan Go Drone RTF includes fun features such as a set of combat streamers to test your flying skills against your friends, a stunt hoop for showing off your agile flight abilities, and a helipad for practicing on-target landings. You can even use the included sticker sheets to customize the JetMan Go Drone and make it your own. The JetMan Go Drone is a RTF (Ready-To-Fly) aircraft, so it arrives factory-assembled with everything needed to experience the fun of RC flight - indoors, or outside in calm conditions. In addition to the previously mentioned built-in features that make the JetMan Go Drone easy and fun to fly, it also includes a 2.4GHz 4-channel transmitter and a USB charger for the factory-installed flight battery. Simply add 3 AAA batteries for the transmitter and you can have your JetMan Go Drone flying missions around the house within minutes of opening the box!